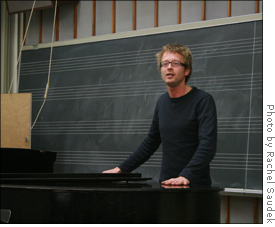 Composition 101 Austrian composer Johannes Maria Staud discussed his orchestral work Apeiron which is scored for 101 players, with Conservatory students. Lanky, blonde and younger-looking than his years, Johannes Maria Staud just arrived in the United States from Austria a few days ago for an exciting event: the U.S. premiere of his orchestral work, Apeiron. First premiered in 2005 by the Berlin Philharmonic under the baton of Sir Simon Rattle, the work was performed last night by the Cleveland Orchestra, and will be repeated tonight and tomorrow..
Staud led a seminar for the Conservatory’s composition majors this past Tuesday, mostly centered on a discussion of Apeiron. Scored for 101 players, the piece is divided into six large sections. The composer himself described his music as “spontaneous” and rarely premeditated. “I don’t believe in a premade architectural plan, I believe in an organic observing of what could come out,” he said. The piece has a diverse mix of sounds, parallel to its instrumentation, moving with poise from a quieter sound typically reserved for chamber music to a thicker tutti sound. The opening is a continuous ebb and flow of ecstasy richly sustained. The score itself is mind-boggling to see, with multiple parts smashed together on oversized pages. Notes are mere ink flecks and miniscule phrase markings are nearly invisible. Staud was recently named Cleveland Orchestra’s newest Daniel R. Lewis Young Composer Fellow for two seasons. Awarded to talented young composers, the fellowship gives composers the chance to work with the orchestra in a lengthy residency. What’s exciting about this opportunity, according to Staud, is the chance to get to know the hall in which his compositions will be performed and the chance to get to know the musicians who will be playing his work. This is the ultimate golden opportunity for a composer; many times, composers don’t get this lucky even with commissioned works. Brendel. Brendel, a widely-hailed pianist and respected Beethoven interpreter, is soon retiring, giving his last concerts in North America.